Ruby chocolate is a unique type of chocolate that is an all natural rose-pink color. That color is all natural and a result of how the chocolate is processed. The process is a trade secret, but it starts with unfermented cacao beans, which means that the chocolate has a wonderful berry flavor instead of some of the more familiar flavors you might associate with chocolate. I recently picked up few packages of this chocolate – it is made by Callebaut – at Trader Joe’s and put it to good use in these Raspberry Ruby Chocolate Chip Cookies. The cookies are delicious: chewy, buttery and with a fantastic berry flavor. The dough itself is similar to what you might use to make classic chocolate chip cookies, but it includes a small amount of sour cream. The sour cream helps give the cookies a chewy texture and also blends very well with the vanilla in the cookie dough. Unlike traditional chocolate chip cookies, the ruby chocolate chips added to the cookies after baking and are not incorporated into the dough. This is because ruby chocolate has a very high cocoa butter content (read: is very creamy and melts easily), so to ensure that they hold their shape well, they are added to the tops of the cookies. This also allows the pink-hued chocolate to really pop – like polka dots! In addition to adding the chocolate after baking, a dusting of freeze dried raspberries is also added to the cookies. 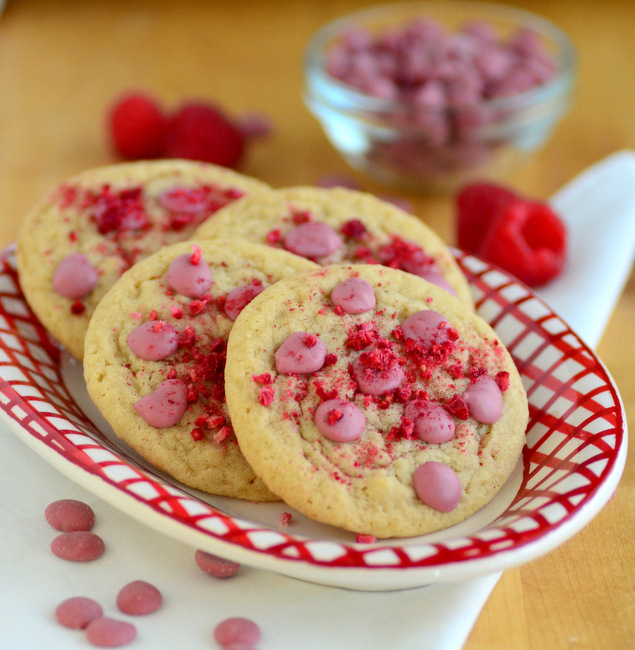 The raspberries tie in beautifully with the fruity ruby chocolate and add a brightness that makes the cookies really come alive when you take a bite. Since both topping elements are added just after the cookies come out of the oven, it is a good idea to bake them in small batches (no more than 6 cookies at a time) so that you have time to place those chocolate chips on before the cookies cool. After they are decorated, the cookies should still remain on the hot baking sheets for at least 5 minutes before being transferred to a wire rack to cool completely. These are wonderful the day that they are made, but the cookies keep well and can be stored in an airtight container for a couple of days after baking. They’re a gorgeous treat for Valentine’s Day or any spring baking occasion, where the berry notes of the cookies are perfect for celebrating the season! In a large bowl, cream together butter and sugars until light and creamy. Beat in egg, followed by sour cream and vanilla extract. Stir in the flour mixture until the dough comes together. Shape dough into 1-inch balls and arrange no more than 6 on prepared baking sheet. Bake for 11-14 minutes, or until the edges of the cookies are golden. Once the baking sheet comes out of the oven, carefully arrange ruby chocolate chips (anywhere from 6-10) on top of each cookie. The chocolate chips will start to melt and stick to the cookies almost immediately. Allow the cookies to cool for 1-2 minutes, then sprinkle crushed freeze dried raspberries on top. After 5-7 minutes on the baking sheets, transfer cookies to a wire rack to cool completely.